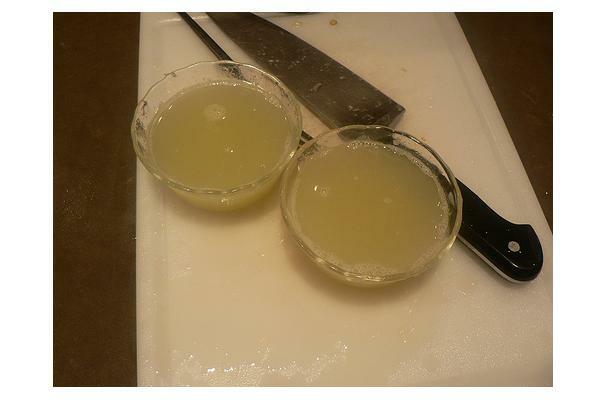 Lime Juice is the juice taken from a squeezed lime. Choosing: Look for a firm lime with no obvious wrinkling or puckering. Buying: Fresh limes are available year round at all grocers. Lime juice- either reconstituted or bottled can be found on the juice aisle at all grocery stores. Procuring: Limes are closely related to lemons. They even look similar to them, especially once they have fully ripened. Until reaching maturity, limes are quite sour tasting. But unlike the lemon, the best lime tree harvest time is just before it turns yellow. Room-temperature lemons, limes and orange will yield more juice than those that are refrigerated. Microwaving the fruit for 15 to 20 seconds before squeezing will help extract more juice. Don't overdo it, you don't want the juice to boil. Use your palm to roll lemon, lime, or orange around on the countertop a few times before squeezing. Cleaning: Simply rinse the fresh limes. If you are concerned about pesticides scrub with a mild liquid vegetable cleanser. If you are using the fruit in a few days, leaving them on the counter will be fine and may help to ripe the fruit a bit more, giving you more juice. If they have been cut, wrap in plastic or place in a small container and store in the refrigerator. Lime juice is used in the culinary world to enhance and brighten many different dishes from beverages to desserts. History: In order to prevent scurvy during the 19th century, British sailors were issued a daily allowance of citrus such as lemon, and later switched to lime, which was not as effective at preventing scurvy but led over time to the nickname "limey" for all Britons. Key limes were introduced to Europe before the Crusades and cultivated in France and Italy during the 13th century. The lime was brought to America by the Spanish explorers around the 16th century.